Flexible manufacturing at its best! We can punch any diameter hole, rectangle, shape, angle, or contour. Programs are created with AutoCAD and Striker software. Our turrets can accommodate sheets up to 4 feet x 10 feet with a maximum sheet thickness of 1/4 inch, and a wide variety of tooling shapes. Up to 33 ton punching capacity. Blanks, draw, forms, shear, and pierce. Up to 60 ton capacity. Our automatic back-gauges and computer controlled rams allow us to handle the most complicated forming jobs with a minimum of set-ups. Up to 90 ton capacity. Our complete line of Welding Equipment is designed to fabricate welded assemblies to our customers' exact dimensions. Our finishing system provides our customers with a durable baked enamel finish in a wide variety of custom colors and textures. This is accomplished by the use of a three-stage iron phosphate pre-treatment system, and high solids paint applied electrostatically. 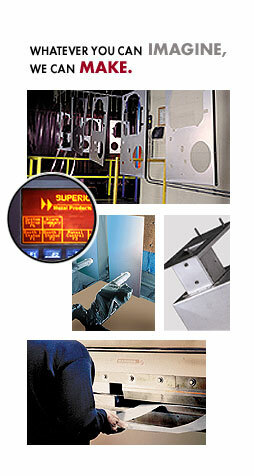 Superior Metal Products utilizes a wide variety of packaging techniques to ensure the safe delivery of a quality product. From our own carton making equipment to our super tough stretch wrapping process. © 2002 Superior Metal Products Co., Inc.